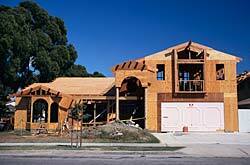 Panelized home construction is becoming more popular for several good reasons. Panelized homes are not only cost-effective, they are energy efficient, faster to construct, and extremely versatile in their designs, too. If you have been thinking about building a new house, or creating that vacation home you’ve always wanted, here are a few reasons why panelized home construction is worth looking into. S.I.P. stands for structural insulated panel. SIP homes are basically panelized homes by a different name. The S.I.P.s used in SIP homes are basically two pieces of load-bearing material sandwiched around an insulating core. These panels reduce the need for using separate structural and insulating elements in the construction of exterior walls; instead of erecting a lumber frame and adding insulation between the studs, SIP homes are constructed with each of these elements contained in uniform, extremely sturdy panels. The S.I.Ps themselves are more expensive as a material than lumber and rolled or batt insulation, but the quickness with which SIP homes can be built can often make up the difference in initial cost by reducing labor hours. With so many people becoming increasingly concerned with the material waste and energy expenditure common to traditional home construction, panelized homes are a welcome breath of fresh air. Panelized homes are extremely energy efficient from the very start. The S.I.P.s used in panelized home construction are insulated to very high standards, and are very likely to reduce heat transfer better than the traditional alternatives. The material waste in panelized home construction is also likely to be lower than that of conventional home building. Though the initial cost of purchasing S.I.P.s is larger than the cost of purchasing lumber and insulation, the extremely tight barrier created in panelized home construction is going to save you many in the long run. Panelized homes are going to have less heat transfer between inside and outdoors no matter what the season. What this means for you: Lower heating costs in the winter, lower cooling costs in the summer, and excellent money-saving potential year round. If you’re interested in building a panelized home, talk to a contractor experienced with this type of building about getting your project started. Most of the companies that build structurally insulated panels have licensed contractors in your area that they recommend and prefer working with, so that’s a good place to start. While panelized construction isn’t difficult, it is different than traditional building. Hiring a contractor with experience means your project will go up as quickly and efficiently as possible, and will allow you more leeway in your design, too.